It has been reported that cedarwood oil has sedative effects when inhaled. In this study, we evaluated sedative effects of inhaled cedrol, which is a major component of cedarwood oil. Accumulative spontaneous motor activity was significantly decreased in the cedrol-exposed Wistar rats. Similar results were confirmed in caffeine-treated Wistar rats, spontaneously hypertensive rats (SHR), and ddY mice. In addition, exposure to cedrol prolonged pentobarbital-induced sleeping time in Wistar rats. To investigate whether cedrol, which has a very faint aroma, affects the olfactory system, the nasal cavities of Wistar rats were treated with zinc sulfate to reduce olfactory function. Two days later, the pentobarbital-induced sleep time was measured as described above. Compared to intact rats, the sleep prolongation effect was decreased in a lavender-roman chamomile mixed oil exposure positive control group, indicating that olfactory function was impaired. In contrast, prolongation of the sleeping time did not change in the cedrol exposure group. 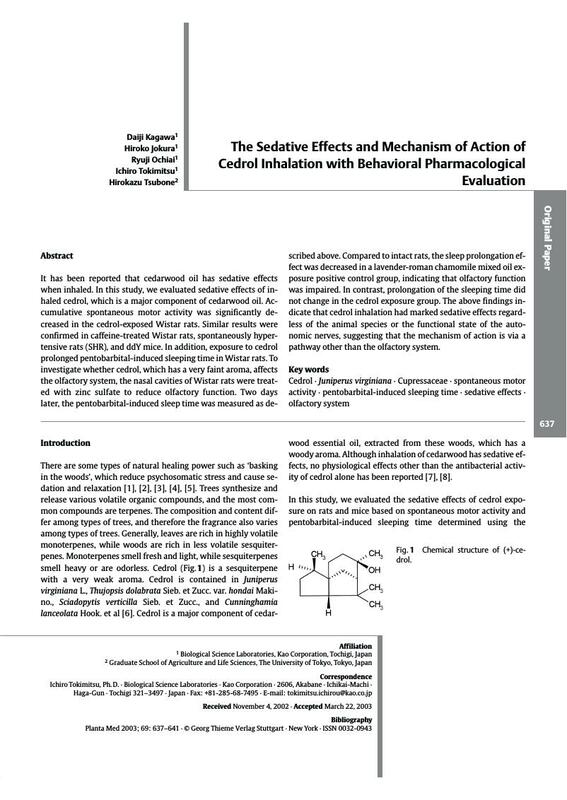 The above findings indicate that cedrol inhalation had marked sedative effects regardless of the animal species or the functional state of the autonomic nerves, suggesting that the mechanism of action is via a pathway other than the olfactory system.